Should We Pig Out for Haiti? Coming to a dinner plate near you, to help Haiti. The disaster in Haiti hardly stirs the appettite. But a Bay Area farmer and a star San Francisco restaurateur are hoping you'll pick up your fork to help out. Jardiniere, an award-winning French-California restaurant in San Francisco's Civic Center, is donating all proceeds from its Monday night $45 prix-fixe dinner to Haitian relief efforts. It's one of many similar events put on by local restaurateurs. But the last-minute foodie event has its genesis in the tight links between Bay Area farmers and chefs -- and their international efforts to boost progressive farming. 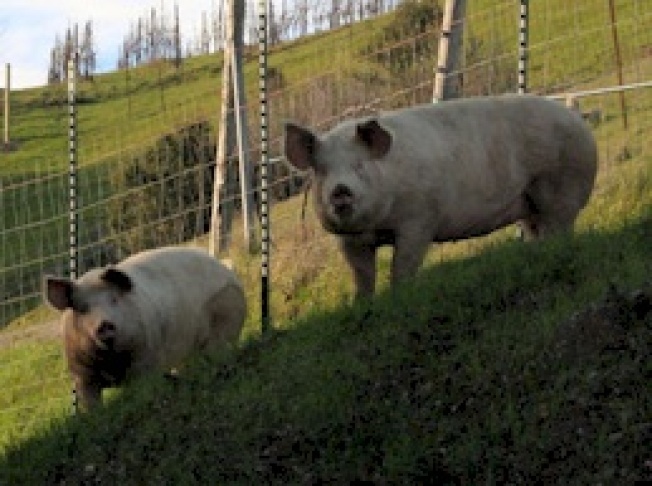 Chef and co-owner Traci Des Jardins had long planned to feature a "nose to tail" dinner of pork from Mark and Myriam Pasternak's Devil's Gulch Ranch in Nicasio, Calif., as one of her weekly prix-fixe dinners. But in the wake of the Pasternaks' volunteer work in Haiti, Des Jardins decided to turn it into a charity event. The menu includes pied du cochon -- pig foot -- and choucroute garni. The Pasternaks have worked for years with Haitian farmers. One project: Helping them raise rabbits as a cheap source of lean protein. The family was in Haiti working to install rabbit hutches when the earthquake struck, and narrowly escaped being trapped in a collapsed building. Funds raised -- a projected $10,000 if the event sells out -- will be donated to Doctors Without Borders and the Devils Gulch Ranch Haiti-relief efforts. For other ways to contribute to Haiti, see our Haiti help page.